You may blend all marinade ingredients together in a blender or simply whisk all ingredients in a glass bowl. If you have kitchen prep gloves double them up and mix all ingredients. Allow to stand at room temp for 20 minute or 2 hours in the fridge. Heat grill to medium high and clean grates well. Cook about two minutes per side. Use long tongs, keep flipping them and move them around the grill. This will ensure a consistent cooking temp for all of the chops. I like them on the grill about 7-10 minutes. Nice medium rare with a crispy char on them. Have extra lemon juice set a aside to knock down the flames I recommend always keeping one section of your grill turned off in case your chops start flame up quickly and char too soon. You can simply slide them with your tongs to the cooler side of the grill!! Allow the flames to calm down and return to the hot side of the grill. Cook chops with grill cover open, never close the grill you will burn the chops within seconds. Rosmarinus officinalis, commonly known as rosemary, is a woody, perennial herb with fragrant, evergreen, needle-like leaves and white, pink, purple, or blue flowers, native to the Mediterranean region. It is a member of the mint family, which includes many other herbs. The name “rosemary” derives from the Latin for “dew” (ros) and “sea” (marinus), or “dew of the sea.” The plant is also sometimes called anthos, from the ancient Greek word ἄνθος, meaning “flower.” Rosemary has a fibrous root system. 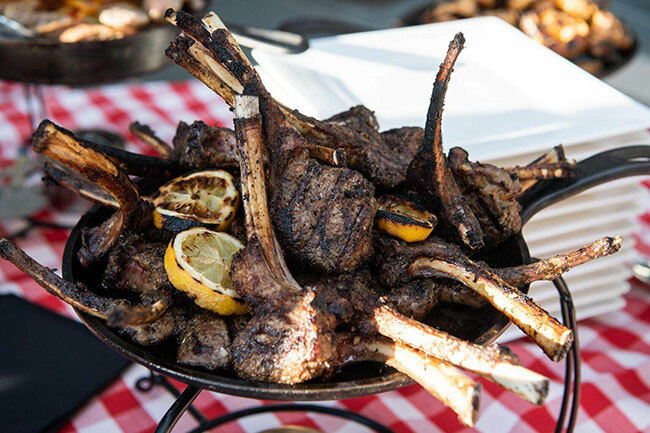 Rack of lamb is often French trimmed (also known as Frenching in the USA), that is, the rib bones are exposed by cutting off the fat and meat covering them. Typically, three inches of bone beyond the main muscle (the rib eye or Longissimus dorsi) are left on the rack, with the top two inches exposed.